MEIEA membership comprises institutions of higher education located in the U.S., Canada, Europe, and Australia. Reporting members represent 58% of the Institutional membership of the Association and comprose approximately 4% of their overall student population with approximately 12,400 students in their departments or divisions. Within MEIEA members' departments or divisions, reporting member institutions comprised approximately 8,000 students involved in Music Business or Entertainment Industry Education. These institutions reported employment of approximately 450 full-time and 900 part-time faculty with more than 38% full-time and 52% part-time faculty involved in Music Business or Entertainment Industry Education. Participating MEIEA member schools enrolled more than…319,258 Undergraduate and 53,014 Graduate Students at their Institutions with 12,441 (4%) Undergraduate and 1,247 (2%) Graduate Students in their Department (or Divisions). In total…7,606 (61%) of the undergraduate and 384 (31%) of the graduate students in their department or division were involved in Music Business/Entertainment Industry Education. They employed… 458 Full-time and 918 Adjunct Faculty in their Departments (or Divisions) with 173 (38%) of their Full-time and 479 (52%) of their adjunct faculty involved in Music Business/Entertainment Industry Education. 25% offer Short-term/Vocational (< 2 yr) programs in music/entertainment industry studies. 15% offer Associates (2-yr) programs in music/entertainment industry studies. 90% offer Bachelors (4-yr) programs in music/entertainment industry studies. 45% offer Masters programs in music/entertainment industry studies. 10% offer Doctoral programs related to music/entertainment industry studies. Chart 1. 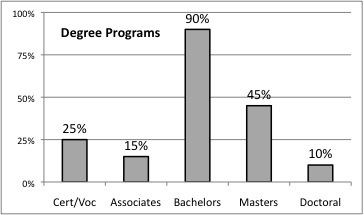 Distribution of degree types reported with programs related to music/entertainment industry studies. 4 % of undergraduate and 2 % of graduate students at their institution. 61 % of the undergraduate and 31 % of the graduate students in their department or division. Faculty Distribution for faculty involved in Music Business / Entertainment Industry Education. 38 % of the full-time and 52 % of the adjunct faculty were involved in Music Business/Entertainment Industry Education. 43 % of member institutions have established terminal degree criteria. 22 % of member institutions' faculty hold doctoral degrees. 49 % of member institutions' faculty hold masters degrees as their highest degree. 13 % of member institutions' faculty hold bachelors degrees as their highest degree. 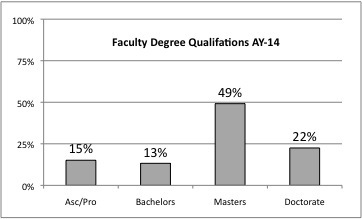 15 % of member institutions' faculty are considered "professionally qualified" and hold no advanced degree. Chart 2. 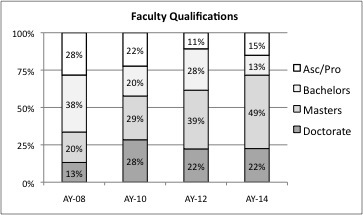 Distribution of faculty academic degree qualifications for academic years 2008 through 2014. Chart 3. Distribution of faculty academic degree qualifications academic year 2014.